I was planning to write about literary agents this week, but I found myself drawn, despite myself, to another topic that has been on my mind a lot lately: breasts. Allow me to explain. My agent—Ian—gave me four basic tips for writing, and they are good ones: 1) avoid adverbs if possible; 2) show emotion, don’t tell the reader about it; 3) shun clichés like the plague; and 4) make sure your descriptions are properly descriptive. Of these four sins—adverbs, narrated emotions, clichés, and empty descriptions—the last is perhaps the most pernicious. Which brings me back to breasts. My copyeditor for SIEGE pointed out that my descriptions of women’s breasts were a bit monotonous. I would add that they were also nonsensical. Of six references to breasts, I described them four times as “full,” once as “ripe,” and once as “budding.” What does full even mean in the context of breasts? Can a woman have “empty” breasts? I don’t think so. And why so much attention to breasts in the first place? Must we know the specifications of every female character’s bust? My difficulties with breasts got me to thinking more generally about how I described characters. I found that I had a couple of empty descriptions that I returned to again and again. First, when describing facial expressions, I was really, really fond of smiling. My characters smiled 131 times over the course of SIEGE, and often in the oddest of circumstances. They smiled wickedly to show evil intent. They smiled furiously. They smiled lustfully. They smiled bitter smiles of tortured sadness. Try smiling a bitter smile of tortured sadness. I don’t think it’s possible. My second go-to empty description was to describe characters—particularly women—as “beautiful.” I did this a startling 42 times. The problem is that calling someone beautiful is not really a way of describing them. It merely begs description. In what way are they beautiful? The answer, it turns out, often had to do with their full breasts. – He drew back in disgust. – The conversation ceased suddenly as Esmeralda stepped through the beaded curtain. Every eye fixed on her. – Helen of Troy was said to have a face that launched a thousand ships. Jenny had a body that had stiffened well over a thousand pricks. – His appetite was legendary. It was said he had once eaten an entire boar in one sitting. – More than one duel had been fought over her between jealous suitors. – She moved with the grace of a dancer. – He had the muscle-bound look of a professional wrestler and the bad hair to match. – She had long, delicate fingers. – He had the thick, muscled forearms of a carpenter or steel-smith. – Her legs were impossibly skinny with knobby knees—like the legs of a newborn colt. 5) While less obvious body parts are useful, keep distinguishing marks—scars, moles, shaved heads, missing limbs, etc.—to a minimum. When used judiciously, such features can be very memorable—think the albino in Dan Brown’s Da Vinci Code. Too frequent use, however, makes them less effective. At one point, no less than five major characters in SIEGE had prominent scars on their face. That’s four too many. I spent most of last weekend refinishing furniture; or, I should say, starting to refinish furniture. My wife instructed me to refinish a buffet and bookshelf to match our new couch, and I envisioned finishing on Saturday morning in time to do some editing and watch some football. But the process, as I learned, is actually much too long (for me, at any rate) to complete in one weekend. I knew that I was in trouble when we went to the neighborhood hardware store, and the helpful clerk kept handing me paintbrushes, sandpaper, and various toxic chemicals until I couldn’t see past the small mountain of supplies in my arms. What, I wondered, have I gotten myself into? Well, for starters, there was stripping the finish off the wood. To do this, I first painted the furniture with a foul-smelling, viscous (think the slime from Ghostbusters II), bluish liquid that burned to the touch. Being the brilliant person that I am, I first poured this caustic substance into a plastic cup. It ate through the bottom of the cup in seconds and formed a puddle on the floor, in which the rest of the cup proceeded to dissolve. (I would later step in this puddle and find that it also dissolves the rubber soles of sneakers.) And this was just the beginning of the beginning. Next, I scraped off the finish, then sanded down the furniture, twice. At this point, I was finally ready to apply the pre-stain, after which would come the actual stain, and after that, the new finish. As I spent hours sanding the buffet (no power sander for me), I reflected on the many similarities between the refinishing process and finishing a novel. Before I started writing, I imagined that novelists wrote their novels, typed ‘the end,’ and handed it straight to an editor. In truth, there is a lot more scraping, sanding, and polishing to be done before a novel ever sees the eyes of an editor. I clearly remember the day in July of 2006 when, sitting under the gilt, neo-Baroque dome of the Library of Congress, I triumphantly wrote the final, magic words for SIEGE: ‘The End.’ It was a joyous moment… for about ten minutes. For an inkling of how I felt, check out this short-film, “Finishing the Novel” (written, directed by, and starring David Wain, and co-starring a young Amanda Peet): http://www.youtube.com/watch?v=LHFEUTvqXR4. I didn’t throw SIEGE on the fire or trash my computer, like David Wain’s character, but I did have mixed feelings. Was I happy to be done? Yes! But now that I had finished a draft, I realized that I wasn’t really done. I had only finished the beginning. In furniture re-finishing terms, I had just finished painting on toxic-goo and melting my sneakers. James Michener once wrote, “I’m not a very good writer, but I’m an excellent rewriter.” Well, I don’t claim to be the next Michener, but I do think I’m a much stronger rewriter than writer. The first time through, I’m just hoping to get the bones of the story down and figure out my characters. The second time, I straighten out the plot and make everything fit together. This is where the hard work regarding the story gets done. It’s not until the third draft that I actually get to work on the writing. I went through four complete drafts of SIEGE before I was ready to show it to an agent. I added scenes, cut chapters, changed characters, and re-wrote the beginning a half-dozen times. The novel shrank from 242,000 words to 230,000 words. And it kept shrinking from there. After I got an agent (more on that in the upcoming Secret Agent Man), I did three more drafts before showing SIEGE to a publisher. My novel went from 230,000 to 150,000 words. Entire sections hit the cutting floor. The beginning was again re-written. The battle scene that starts the book went from one-hundred pages to five. Did I miss those pages? Yes, but the cuts definitely made the novel better. After I sold the book, I worked with my editor to produce two more drafts, cutting the book down to 137,000 words. I added a few more scenes and took out a couple of extraneous plotlines. Just today, I finished up making changes to the copy-edited manuscript. Over four years after I finished SIEGE, I finally finished SIEGE. Of course, it doesn’t have to take that long: I was learning along the way when I wrote SIEGE. I’m blazing through five drafts of my second novel in one year. But no matter how long it takes, all manuscripts must be re-finished before they’re finished. But isn’t that what editors are for? Well, no. Editors are there to help you polish your work. They’re not there to do the heavy-lifting of plot and character development. Especially as a first time novelist, if your writing isn’t excellent to begin with, then it will be hard to get a publisher to even take a look at it. The better your manuscript is, the better chance you have of selling it. Don’t wait until you have an editor to make edits. 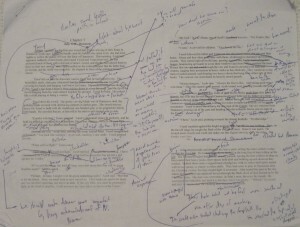 And editing will not only help you sell your novel, it will make it much easier to write. Trying to pin down plot and characters while also writing clean, elegant prose is damned hard. So take it easy on yourself. Get your ideas down first, then you can cut them down to size and polish them up later. And, on that note, I’ve got to get back to editing my next book (and refinishing the buffet). Come back next week for the exciting story of how I got my agent: Secret Agent Man. Once you get past the rather bizarre hours, one thing should jump out at you: that’s a lot of writing! More writing, in fact, than sleeping, eating, and socializing combined. And this leads me to a rather upsetting truth: the annoying thing about being a writer is that you have to write. I know that this should have been obvious, but somehow when I thought of novelists I always tended to think of tweed jackets, book tours, and cocktail parties filled with witty conversation… the way they look in movies. Sure, when inspiration comes, they sit at a desk and bang out words on occasion, but that is just an inconvenient necessity, the mundane work required for the greater goal of being an author. Right? Nope, not so much. The thing about inspiration—and it took me a long time to learn this—is that if you wait for it, it usually never comes. You have to work for it. You have to write for hours, every day, even when you’re not inspired. For a long time I tried to write part-time, but it never worked for me. In writing SIEGE, I set aside chunks of time—a couple of weeks, a month, and in one instance a full six months—when I could do nothing but write for six to ten hours a day. I made writing my full-time job and worked part-time to support it. Most of what writers do, I finally realized is… write. That’s when things finally began to click. Again, this seems obvious, but I’ve met enough people who share my delusions about what the writer’s life is like to think that this misperception is wide-spread. While living in Paris, I attended a writer’s workshop in an appropriately atmospheric room—sloping roof, shelves overfilled with books, old leather couches, a single tiny window with antique glass. The workshop was filled with would-be authors who certainly looked the part: a white-haired fellow in tweed and spectacles; a sharp-edged Parisian woman in a black turtle-neck, skirt, and knee-high boots; and innumerable young men in ragged clothes, notebooks clutched in hand. They were all very earnest about becoming authors. Unfortunately, none of them seemed very fond of writing. Sitting in cafés and talking about writing, yes. Actually sitting down and putting pen to paper or finger to keyboard, no. But isn’t that the way it’s supposed to be? Didn’t Walter “Red” Smith—the first sports writer to win a Pulitzer—famously say: “There’s nothing to writing. All you do is sit down at a typewriter and open a vein”? Isn’t writing supposed to be hard? Well, yeah, writing is sometimes hard. Sometimes I struggle with scenes, or chapters. Sometimes I feel like I’m writing garbage. Writing is often hard for me—but torture? If writing is torture, then stop! There is no sense torturing yourself on a daily basis. There are other jobs in the world. As for me, I have found that I love writing, and the more I do it, the more I like it. It’s a bit like travelling in Italy. They say that tourist should start in the north, and if they like it, head further and further south. Italy will only get better. If you don’t like the north, then stop. Italy is not for you. “What’s it like being a writer?” I get asked that question a lot. Well, there are lots of coffee shops involved. I spend a lot of time doing research. And, of course, there’s lots of writing. Simple enough, right? Well, judging by the number of books on “how to become a writer” for sale at my local bookstore, there must be a lot more to it than that. The world is full of advice on how to become an author—some of it good, some of it bad. Most of it shares one thing in common: it is written by people who are already authors. On the one hand, this is a good thing—these people should theoretically know what they are talking about. On the other hand, because they have already “made it,” they sometimes miss the most crucial points. And often, they have forgotten the trials and tribulations they suffered along the way. I’m still making my way, and I remember the trials and tribulations all too well. I’m finding new ones all the time! So, for the benefit of readers and would-be-writers alike, I’m going to explore some of the mysteries of the writer’s world: What is it like writing a book? How does one find an agent? What exactly do editors do? Do all authors need a website? Why do second novels tend to be so much worse than first novels (aka, “the curse of the second novel)? In this blog, I’ll be relating my own experience as a first time novelist, learning not only how to write, but also how to navigate the world of publishing. There will be advice, yes, but this is not an advice column. It is my experience. Do with it what you will.